I wanted to make Idli/dosa with millet for a change. Hence tried making in the similar way we make our regular idly dosa better. But I have tried grinding the batter with mixie as i had only small pocket of barnyard millet (kuthiravali). The results are good and there is no major difference in taste from regular idlies. 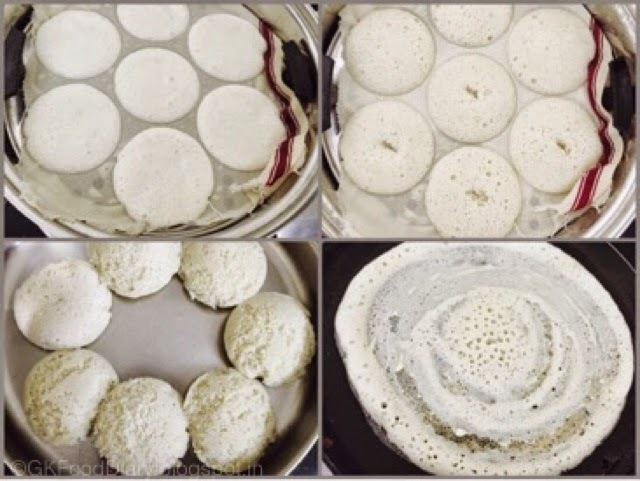 Idlies turned out super soft and I could make crispy dosas too. Next time I can confidently try grinding bulk quantity in grinder. Wash and soak millet and urad dal with fenugreek seeds separately for three hours at least. Start grinding the urad dal first by adding little water in frequent intervals. When the bubbles starts to appear and the batter is fluffy, it's done. I have added approximately one cup of water to grind the urad dal. Transfer the urad dal batter to a separate vessel. Then filter the water completely from soaked millet using a strainer and grind by adding very little water with salt. Grind it till smooth. It took ¼ cup of water for the millet to grind smooth. 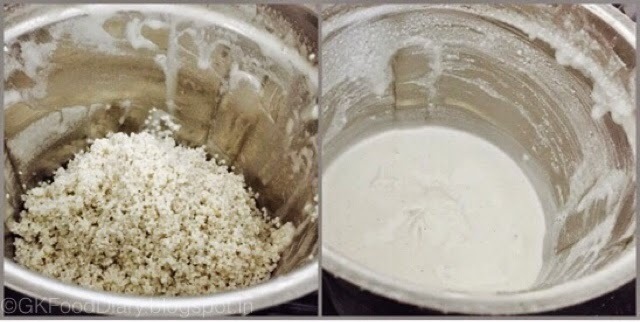 Transfer the millet batter to the same vessel and mix with urad dal batter well with your hands. Let it ferment for overnight or for eight hours. Next day the batter should be raised as shown(right hand side image). Now you can start make idlies using the batter. 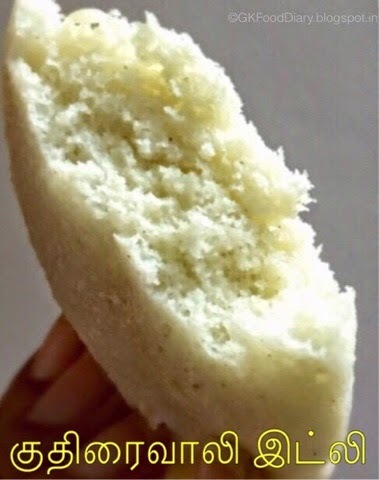 Heat the idly pot with one cup of water and fill the mould of idly plate with batter. Steam it for 8 to 10 minutes. Then unmould the idlies from the plate. For dosa's add little water to the batter and make. 1. Start grinding the urad dal first by adding little water in frequent intervals. When the bubbles starts to appear and the batter is fluffy, it’s done. I have added approximately one cup of water to grind the urad dal. Transfer the urad dal batter to a separate vessel. 2. Then filter the water completely from soaked millet using a strainer and grind by adding very little water with salt. Grind it till smooth. It took 1/4 cup of water for the millet to grind smooth. 3. Transfer the millet batter to the same vessel and mix with urad dal batter well with your hands. Let it ferment for overnight or for eight hours. 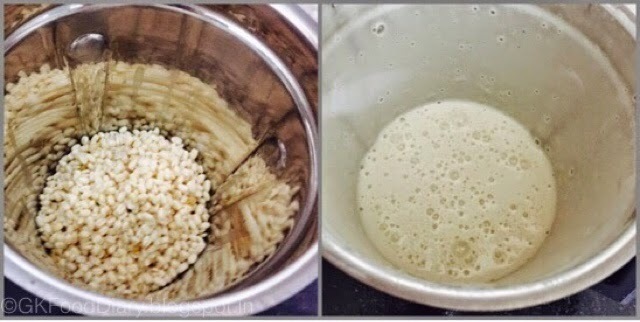 Next day the batter should be raised as shown(right hand side image). 4. Now you can start make idlies using the batter. 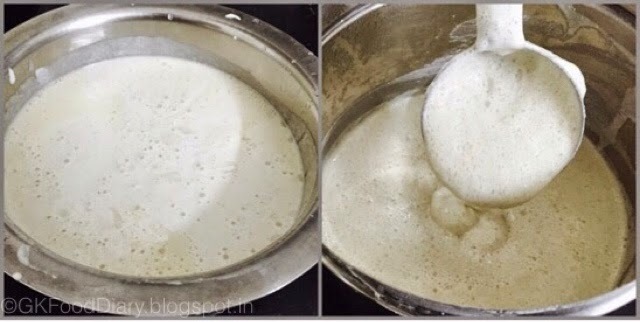 Heat the idly pot with one cup of water and fill the mould of idly plate with batter. Steam it for 8 to 10 minutes. Then unmould the idlies from the plate. For dosa’s add little water to the batter and make. 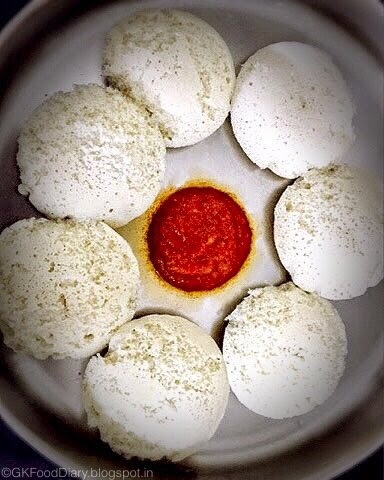 Serve the idlies / dosa’s with chutney of your choice . We had it with small onion chutney. 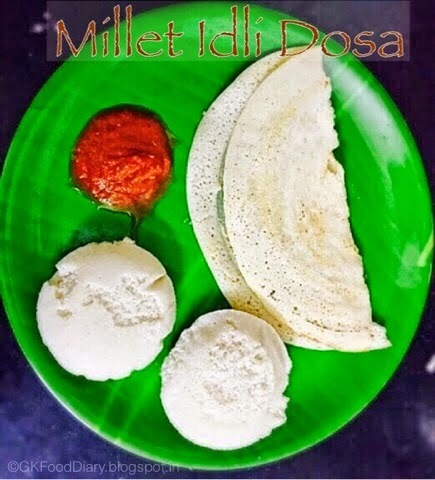 Perfect combo for millet idly ! 1. You can try this recipe with other millets such as Varagu, samai or thinai too. 2. The amount of water mentioned in the post is to give a rough idea. Adjust as needed. 3. The same process can be done in grinder too.